For most people, death is not a good thing. It’s an inconvenience at best. Death stops us in our tracks, and we are forced to deal with things that we ignore in our day to day rat race that we cal life. To our spirits, death is a very good thing! Anything that stops our mundane routine, lifts the veil of our illusive reality and helps us to face our shadows can expand our spirits and feed our souls. Death brings rebirth! I took the photo below only a few weeks ago at the beautiful Pashupatinath Temple in Nepal. 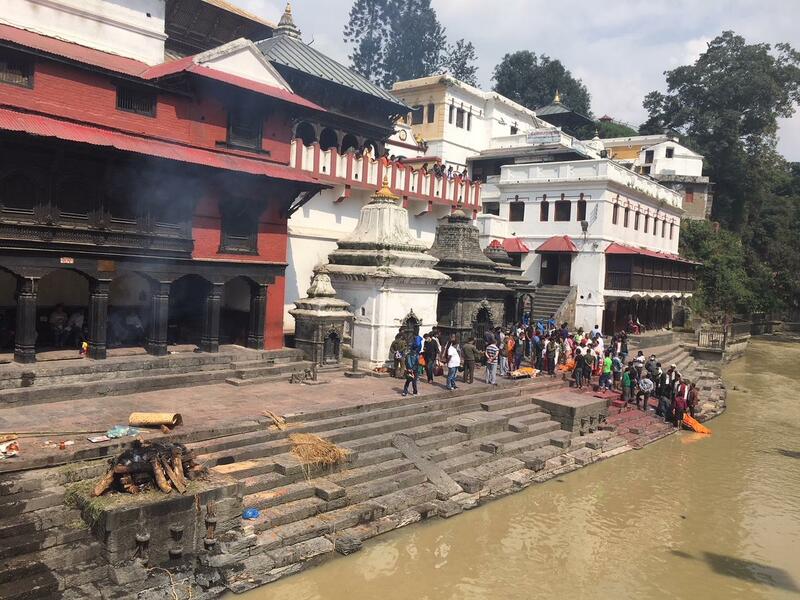 95 percent of the people that die in Kathmandu are cremated by the river that rungs through the temple, and after blessings and rituals, their ashes are sent down the river to the Great Source. Above the temple, I saw a huge portal of light, a doorway into the heart of Great Spirit. Our beliefs and perspectives create our reality. So, transforming our beliefs and perspectives about death and dying will bring more freedom, satisfaction and joy into our lives. Do you want more freedom, satisfaction and joy in your life? Goddess Mother Death is one of my beloved Spirit Guides. She has taught me a lot about life and immortality, about shedding diseases and ill-beliefs and letting more life force into my physical body. I learned that a conscious Death and Rebirth experience can align us with our Highest Selves and with Universal Truths, while opening space for our desires to manifest. Through Death and Rebirth we can wake up from the rat race that we were born into, as we face our shadows and fears, and allow them to shed. Death of the old gives birth to all kinds of wonderful new possibilities, it recreates us. But, as humans, we get caught up in fearing and grasping, yearning and hoping, unwilling to let go. As the old self dies, many of the addictions, attachments and wrong beliefs die with it. It’s important to continue to release whatever creates resistance, anxiety, overwhelm, fear and suffering, to open space inside of us for all the things we have been asking for. This work is preparation for our physical Death as well, so that when time comes for us to leave our bodies, our final breaths can be full of healing, love and connection to Great Spirit, instead of fear and regret. We can learn to use the healing and transformation that death brings to clear a lot of negative karma from our family lineage. But, we don’t have to wait for our physical death! Through the Wisdom of Death and Rebirth process we can become our true selves now, by shedding our masks and egoic personalities. We can use the gifts of Death while we are alive. As I tune into Great Spirit, I see how short this life truly is, as compared to the life of my Infinite Undying Spirit. From my Spirit’s eyes, life is just a moment in timelessness and death is only an illusion. CLICK HERE to register for Wisdom of Death and Rebirth coming up on Sunday, October 28 from 3-6 pm at the Awareness Center in Pasadena. Are you creating your thoughts?